Hughes the Force - An Homage to Star Wars and John Hughes! 05/04/12: Hughes the Force to be released May 25th!!!!! Making the announcement in honor of "May the Fourth Be With Hughes", we are proud to bring Hughes the Force to the masses May 25th, 2012. In celebration of the 35th Anniversary of the release of Star Wars Episode IV: A New Hope, we are teaming up with filmmaker Kevin Smith to release the film via his new YouTube Channel: SModcast Internet Television (S.I.T.). |Absolute Value| Pictures will also release its short film worldwide for download here at the Hughes the Force website. The film will be freely available to all for download in a number of digital formats for both PC and Mac, as well as mobile versions for Android and iPhone. Also available will be Blu-ray and DVD files complete with menus and bonus content for burning to your own discs. The Making of Hughes the Force featurette - a behind-the-scenes footage from the set and interview clips with the Director J.C. Reifenberg, Producer Ruark Dreher, and Actor James Arnold Taylor. Commentary Tracks - multiple tracks featuring the lead actors and the production staff covering a range of topics including the writing, cinematography, production work, and acting. Pop-Up Video Track - behind-the-scenes trivia throughout the film. Come back here to download the movie on May 25th! 01/06/2012: HTF Screens Next in Seattle January 28th! In celebration of the closing of Ltd. Art Gallery's Star Wars Exhibition, "These Are the Droids You're Looking For", a reception will be held at the gallery and will feature the Seattle premiere, and only third public showing, of the short film Hughes the Force. The reception will be 6-10pm, with the film screening at 8pm. There will be refreshments, film swag giveaways, and appearances by costumed Star Wars characters courtesy of the 501st and Rebel Legions. The much acclaimed art show, on display since December 8th, features artwork from ACME Archives, and featuring art from Ralph McQuarrie, Brian Rood, Steve Thomas, Greg Peltz, Andrew Wilson, Augie Pagan, Andrea Wicklund, and many more. The screening will be followed by a short Q&A featuring Special Guests from the film's cast and crew including lead actors Nathaniel Weiss (Simon), Taylor Treadwell (Leia), and Producer Ruark Dreher. So, that begs the question then... "When will Hughes the Force FINALLY be released?!?!?!?! Well, we have a great opportunity for distribution that we are anxiously awaiting to finalize before we can announce anything further. We so very much appreciate your patience and hope you hang with us a little longer - we want to get the film to you in the best way possible... If things fall through however, we are prepared to simply release it online. Either way... it's coming soon. Coming up for 2012 the only other thing planned as of now is we hope to have a presence at Star Wars Celebration VI - whether that be a screening/panel, booth, etc., is yet to be determined, but J.C. and Ruark will be in attendance for sure, and hopefully with others of the cast/crew as well. We'll announce the film's release details as soon as we possibly can. Thank you for all your support. 11/3/11: HTF At ComiKaze Expo This Weekend! Hughes the Force will be screening at the ComiKaze Expo at the Los Angeles Convention Center on Saturday November 5th, at 2pm in Room 1. Following the screening, Director J.C. Reifenberg, Producer Ruark Dreher, and Cinematographer Steve Koistinen will be joined by the main Cast, including Justin Okin (Henry), Nathaniel Weiss (Simon), and Taylor Treadwell (Leia), on-stage for a quick Q&A session. Come see the John Hughes - Star Wars mashed-up independent short that everyone is talking about... Including most recently the L.A. Times! 10/08/11: Hughes the Force Screens at Fan Days! Hughes the Force screened at this year's Star Wars Fan Days in Irving, TX with resounding success. J.C. Reifenberg, Ruark Dreher, Steve Koistinen, and Joe Hogan were in attendance and had a booth where fans could see the trailer and pick up some swag - "Stormtroopers playing pool" mini-poster and Princess Leia bookmarks. After the convention hall closed on Saturday, fans made their way to the ballroom for the show. After a quick introduction by J.C., the movie began to an eruption of cheers from the audience. There were hoots, hollers, and laughter throughout. The screening was followed by a Q&A with the gang moderated by Mr. Steve Sansweet. Video of the Q&A has found its way onto YouTube via the Nerd Heard Podcast. You can see it here: Part 1 and Part 2. Thanks to all the fans who came out to watch the film and stopped by the booth to say hi and give us such great feedback. As a project by fans for fans, we're glad you enjoyed it! ...To a packed audience at the Harmony Gold Preview House on Sunset Blvd in Hollywood, CA. Commander Jet and his Shadow Ops Clone Troopers caused passing traffic to stop while welcoming guests to the red carpet. Cast, crew, and attendees had their photos taken with Boba Fett, Han Solo, rebel pilots, and other members of the 501st and Rebel Legions. The screening also benefited Catherine Taber's www.gamesforsoldiers.com, with guests bringing video game and comic donations. The film ended with a standing ovation and a Q&A session with Producer/Director/Writer J.C. Reifenberg, Producer Ruark Dreher, and Producer/Cinematographer/Writer Steve Koistinen, moderated by the voice of Obi-Wan himself, the great James Arnold Taylor. Everyone left the premiere with a gift bag that included a movie poster and a copy of the prequel comic. The occasion marks the culmination of a year-long effort to bring a passion project to the screen for this great group of professional filmmakers and friends who are not only huge Star Wars fans, but also many of whom grew up in the same home town as John Hughes. Upcoming screenings of the film include Saturday evening October 8th at the Fan Days in Irving, TX as the feature event kicking off the convention after-party. The film will next screen back in Los Angeles at the ComiKaze Expo November 5-6th. We are in the last stretch getting the movie ready to show: dropping in the final VFX shots, final color-correct, and laying in the score. The movie will be the ultimate power in the universe in just a matter of weeks. We have already announced our first public screening at Fan Days. Stay tuned for the announcement for the Los Angeles Premiere date! 08/30/2011: HTF To Screen at Fan Days! Hughes the Force will have its first public screening at Fan Days in Dallas, October 8. Our screening will kick-off the evening's After-Party once the convention hall closes. We will show the movie, and then there will be a Q&A panel with J.C. Reifenberg, Ruark Dreher, Steve Koistinen, and Artist Joe Hogan. The panel will also be moderated by none other than Steve Sansweet! 07/29/2011: HTF Announces Prequel Tie-in Comic! J.C. Reifenberg first announced the comic and discussed the project with Jason and Jimmy of the ForceCast podcast, live on their July 26th broadcast, which will be released for download July 29th on their website. Comic critic Ryan Porter at The Comics Corner was given an exclusive first preview of the comic and posted his review immediately following the announcement on the live broadcast. A first-look at the comic can be seen in three different locations: two exclusive pages at The Comics Corner review, a third exclusive page via the ForceCast and a fourth exclusive page posted by Joe Hogan at his Deviant Art page. It has been a busy month of post-production and gearing up to release the film. The first and second edits have been completed and the film is looking great, clocking in around half an hour. We are continuing to tweak the film, as well as add in some pick-up shots. The one remaining scene to be shot is scheduled for the end of the month. We are also finalizing a few more celebrity cameos that you all will enjoy. There was even a bonus scene we filmed with James Arnold Taylor, that will be a real treat for everyone too. While we had initially hoped to have the movie done by this time, so many good things have happened that have also caused it to take longer than expected - but all for the better. We have not set a release date yet, but once we are able to fix a date, we will let everyone know how, where, and when you can see Hughes The Force! On May 28th, J.C. and Ruark were graciously invited to join Stephen Stanton and his fellow actors Rick Fitts and Michael Gregory, at the Rancho Cucamonga Paul A. Biane Library's Star Wars Day. It was a great day, turnout was around 6000! A huge shout-out to the Library Staff, and Mike, Jessie, and everyone at the Inland Empire Fan Force, and of course Stephen, for having us there. We were able to get out the word about the upcoming film and J.C. even signed autographs! You can see photos on our Facebook page, as well as on IEFF's page. Coming up, we will be traveling to San Diego Comic-Con. While the film will not be in this year's Star Wars Fan Film Challenge, we will be there promoting it, handing out fliers and posters. J.C., Ruark, Steve, and a few others from the production will be running around. Keep an eye out for us and follow us on Facebook for up-to-the-minute updates! Over the weekend of April 29th we filmed the exterior shots for the Party scene with great success. It was a long weekend of shooting till early hours in the morning but the footage looks really great. Also filmed a special bonus scene this past week - but all that we can say is that everyone will really enjoy it. HTF's friend, Stephen Stanton, aka Capt. Tarkin, handed out our cards at the Anaheim Comic Con. You can see photos of Stephen at the Con on his Facebook page. J.C. and Chad have begun work this week cutting the film together for the first edit. And as soon as the rough edit is done, Andy can go to work on the musical score. 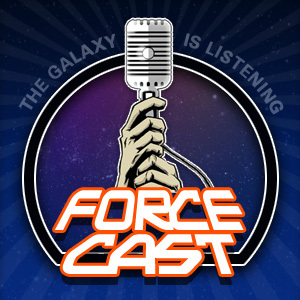 Coming up, J.C. will be interviewed again on The ForceCast, as well as on The Sarlacc Pit Podcast. We will have some more big announcements to make on those shows. Stay tuned! The official movie poster has been finalized with the addition of the movie credits to the artwork. We have also created a 4x6 postcard flier that shows the poster on one side and talks about the film and includes production stills on the back. Both can be found in the Artwork gallery on the Behind-The-Scenes page. The fliers can be found this Saturday at the Anaheim ComicCon on the autograph table of HTF's good friend, Mr. Stephen Stanton (website, Facebook), who, most notably to SW fans, now voices Captain Wilhuff Tarkin on Star Wars: The Clone Wars. If you are attending the Con, please stop by and see him. He is offering his autographs free of charge and will be attending Saturday only. Also, our Artist Joe Hogan, is now taking pre-orders on his first self-published art book, WTF! The Art of Joe Hogan. It has been announced that artwork from Hughes The Force will be included in the book. In honor of that, as a HTF exclusive, the first 138 pre-orders that mention the HTF poster will also receive one of the 4x6 flier cards, courtesy of the Producers here at Hughes The Force. Please go support our new favorite up-and-coming Artist! Hughes the Force is giving Star Wars fans everywhere a sneak peak today at Star Wars: The Clone Wars actors James Arnold Taylor and Catherine Taber in full costume playing their roles of Obi-Wan Kenobi and Padme Amidala. Every week, James and Catherine use their amazing voice talents to bring their characters to life in cartoon form, but with the release of Hughes the Force this summer, fans everywhere will be able to associate the voices of some of their favorite Clone Wars characters with the actors' faces, who also look uncannily similar to their film and cartoon counterparts. The behind-the-scenes photos from the set highlight James wearing the Star Wars Episode III Obi-Wan Kenobi costume, provided by Museum Replicas, and Catherine donning a customized white Padme Geonosis costume. Over the weekend of April 2-3, we filmed the Living Room scene. Filming started Saturday evening, went very late, and started up again Sunday morning for the rest of the day. Things went very well. With plenty of coffee and donuts, the Cast and Crew rallied from the late night and pulled off a great scene. A new Gallery has been added to the Behind-The-Scenes page, check out the new photos! Visit this link to ForceCast.net to listen now, or download the show in MP3 format, or even download the Android and iPhone mobile ForceCast apps! The interview is the last half-hour or so of the show. Be sure to then visit us on Facebook and tell us what you think! Director J.C. Reifenberg joined Jason and Jimmy Mac on The ForceCast live broadcast tonight to announce our project. J.C. talked about some of his fandom and love of all things Star Wars and John Hughes. Jason and Jimmy took a call from "Ben from California" to ask J.C. some questions... And as we all know Ben is none other than James Arnold Taylor (voice of Obi-Wan Kenobi on The Clone Wars), who really called in to announce along with J.C. that indeed, he and Catherine Taber (voice of Padme Amidala on The Clone Wars), both will be featured in Hughes The Force - in full costume as Obi-Wan and Padme for the fist time on film!!! The second trailer posted here on the site is a teaser announcing James as Obi-Wan. A similar trailer announcing Catherine Taber is in production and it will be posted soon! 03/23/2011: Website and Trailers go Live! The website is live and you can browse around and look at the Cast, Crew, photos... and two trailers! 03/23/2011: Website Up and ForceCast - Live! Today this website goes live. J.C. will be featured on tonight's live ForceCast podcast at about 6:30pm PDT. You can listen live here. At the time of the show, we will be posting up the first trailer here on the Video page above and on the Facebook Page. After a hard two weeks of filming, J.C. and Ruark took a break and headed up to San Francisco for two days to visit ILM/LucasArts and Big Rock/Skywalker Ranch. A big thanks to Andy Bell and Kevin Stermer for hosting us! After the visits, Ruark headed back up to Seattle, where he lives, and will continue production work from there until filming resumes. 03/08/2011: HTF Movie Poster Released!!! At last we can reveal our poster to the fans. Take a look at the poster in the Posters gallery on the Behind The Scenes page. The poster is based on the Star Wars "Circus" poster, and Joe did a great job with capturing the story the likenesses of our actors. Day 3 of big 4-day shoot. The Prduction crew is doing a great job and the actors are putting forth great performances. We absolutely nailed the bar scene, getting through filming relatively efficiently and getting some incredible footage, which you'll see get to see pieces of in the first teaser trailer. You can see some photos in the Bar gallery on the Behind The Scenes page above. Had some other awesome things happen on set today that we will save to announce shortly. Also a HUGE thank you to Shawn "Obi-Shawn" Crosby and the 501st and Rebel Legions for coming out for a great day of filming. Filming has begun on HTF with two big days of shooting after a hard week of ramping up preproduction to get ready. See photos from the Convenience Store scene in the Gallery on the Behind The Scenes page above. The production just received the most unbelievably good news this morning that will make this film more powerful than you can possibly imagine!!! Can't talk about it yet, but we will be making HUGE announcements very soon as we get into filming... which starts in 4 days! For most of January, casting was ongoing, and finally complete! We found a great group of actors that we are very excited about. In December, J.C. and Ruark attended the L.A. screening for The Clone Wars' Nightsisters/Savage Oppress trilogy. At that event, J.C. and Ruark approached Ashley Eckstein, founder of Her Universe and voice of Ahsoka Tano on The Clone Wars, and discussed the film project. Ashley and her partner, Dan Madsen, have been working with us and we are now pleased to announce that the HTF actors will be featured in their apparel. Hughes The Force is pleased to announce that artist Joe Hogan will be creating a movie poster for the film! See examples of Joe's art at his Deviant Art website. After Star Wars Celebration V, J.C. Reifenberg knew that he had to dedicate himself to making HTF. Script writing with Steve Koistenin and Justin Yates began in earnest. A chance meeting at CV between J.C. and Ruark Dreher eventually led to Ruark becoming a Producer on the project, as well as bringing in his newly-acquainted artist friend, Joe Hogan. The Hughes The Force page begins at Facebook.com/hughestheforce. The first incarnation of Hughes The Force began as a pitch to Atom.com for their Operation Olivia Star Wars Fan Film Challenge. While finding favor with the editors, but not Olivia, J.C. knew the idea was solid, and it has since grown and developed into the full-production short film you see here.